Club Creative Studio’s Feature Friday blog post: Inspired by wood. Welcome to Club Creative Studio’s Feature Friday post. This week, I was inspired by wood. 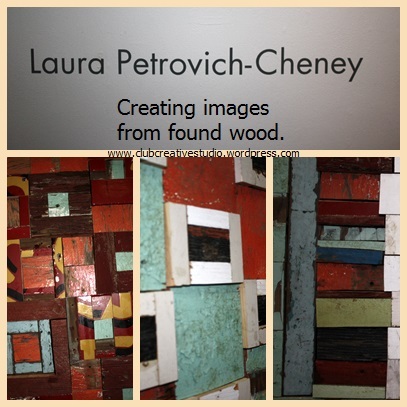 The Asbury Park, New Jersey Artist: Laura Petrovich-Cheney creates in mixed media and her work is part of a solo series at the Abington Art Center. I can appreciate her love of texture and creations from found wood items. Gathering her art supplies from her daily walks and traveling adventures, Laura uses reclaimed wood pieces in a creative quilt-like way. Making small alterations to the wood she adds depth. You may find wood intentionally burned, impressed, sawed, pierced, or hacked not to mention processes such as casting or cleaving. 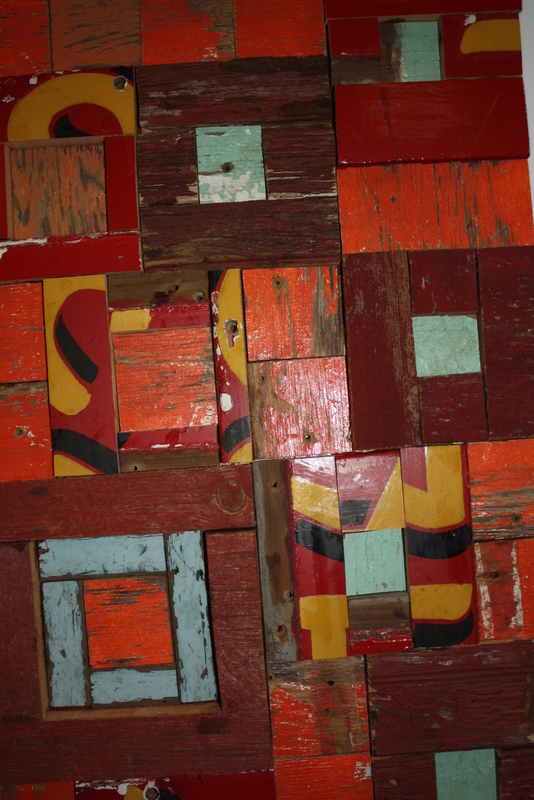 I immediately thought of the “crazy quilt” pattern when I first laid eyes on the irregular grid organized wood scraps. Her raised surfaces put dimension to that same material quality of a hand-made quilt. The recent tragic weather activity on the east coast has washed up interesting wood scrap treasures for Laura to consider in her art creations. So, if you are venturing out along the coastline for a walk, you may find this MFA holder in Studio Art, MS in Fashion Art, and BA in Fine Arts artist walking along side you. She will be the one gathering interesting scraps of found wood. It seems upon looking closely to her art, she combines wood pieces from random finds and original objects. I was inspired to create future beads with similar random patterns and color combinations. Do you see the square with brown, sky blue and pumpkin orange colors in the first photo for example? I’d love to replicate that feeling in a few beads. Stay tuned as I attempt to incorporate the pattern or color choice into hand-rolled clay beads soon. You know that I will post pictures of my finished project here on the blog and on Facebook at http://www.facebook.com/clubcreativestudio. Thanks for stopping by and admiring this found art. Your comments are always welcome, especially if this technique strikes interest. STOP! Think twice before you discard that juice pouch. It’s always good to recycle. Our carbon footprints are being tracked more than ever before. If you have young children, grandchildren or you like acting like a child yourself…by drinking from a juice pouch you know that those containers can quickly add up in your trash piles. What to do, what to do? Well, I can tell you what to do with them. Be creative! If you have not seen hand-made containers made from juice pouches and juice boxes, you are missing out on a creative find. It’s the innovative mind with the desire to be green that sparked a craze that is fun and functional. I have seen bags, purses, coin purses and other woven and stitched creations originating from the use of this recycled container. Make sure that you wash and dry your pouch. The best type needle to use may be the upholstery type. If you are hand-stitching, you may want to pierce the initial holes you will need by dragging a hole punch along to pre-drill (so to speak) your indention for the needle and thread or yarn or ribbon. Ask your fabric shop to suggest the best strength for the material and your machine. If hand sewing this project, use a stitch that doubles for strength. Perhaps a serger would be the fastest way to secure and create this project. To wash later, wipe with a damp cloth. It can serve you just as material fabric would only it is a bit more stiff, even with wear. And speaking of “wear”. 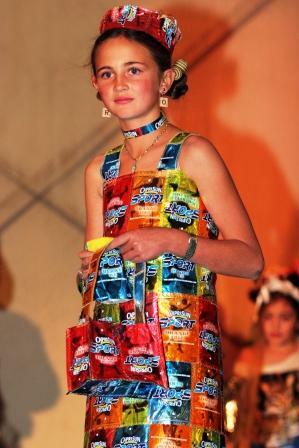 Would you like to create clothing from juice pouches and wear your art? Feeling empowered to sew something a bit more intense? I am not sure where to credit this photo from but, it serves as a great inspiration for illustration to create with pouches. While researching this project, I found that many are out for a profit to sell you their patterns, techniques tips and product. I did find a young lady who I felt did a good job being concise and who has made her own instructional video. She has supplied the information for free via YouTube. Who doesn’t like free? Starting out simple, create a pouch first. Let’s find out how we can create our own pretty recycled pouch! Today, I highlight Sarah Buckhouse who may someday make a great art teacher (in my opinion). This is her lesson. Are you inspired to drink juice or sew? Maybe this post has inspired you to do both? Enjoy learning from this video, and good luck creating from your trash. I’d love a purse with the scent of grapes or fruit punch wouldn’t you? What a great quote to start off this blog from Club Creative Studio. I welcome you to take a few minutes to watch this video and be inspired from a nine year old boy’s creativity. If you have ever wanted inspiration to create and use low-cost materials then take a look at what this YouTube sensation video has to offer. You’ll witness simplicity of dreams from the eyes of a child, using his creativity and cardboard. It’s CREATIVITY at its best. Bringing tears to my eyes having heard about this a while ago and then again as I post today on the Club Creative Studio blog: I share this highlight, as I continue to watch the wheels turn and confidence grow in creative thoughts of a young boy, Caine. Be inspired! Be CREATIVE! A few months ago I was taken back. I was transported to the past where fond childhood memories were clear as day. It was at a craft fair that took place around the Christmas holiday. I attended with my neighbor. Many rooms were decorated with items for sale. There were many trees set up with ornaments for sale and there were many people doing their holiday shopping. It wasn’t until I went upstairs to a particular room that I experienced my flashback. The flash from the past was a clear as the days of old. I was in utter amazement in what was sitting under a decorated tree. I discover in this room, a childhood friend. Something so familiar and missed that seeing it brought tears to my eyes. REALLY! I dropped to the floor on my knees to get a closer look. I reached out to hold this dear object and I picked it up gingerly. WOW! It was meant to be! Finding this lost treasure from my past was a sign that I needed to buy it for myself. For a second or two, I needed to reward myself and take back, reclaim what was a big part of my life in the past. I had to have that doll! This is Mrs. Beasley and me. She is my blast from the past doll. The doll was made popular by the sit-com, family show starring Brian Keith. It was called: Family Affair. Keith played an uncle who was put in charge of these adorable twin children named Buffy and Jody. Mr. French was a supporting character as the butler. It was one of those feel good shows that I just loved watching as a child on television. Buffy had a Mrs. Beasley doll on the show and they were pretty popular dolls. The fabric of the doll’s body was blue and white poka-dot. It was a very stiff-stuffed doll with arms, torso and legs, that were solid and great for wear and tear. That doll was durable. Mrs. Beasley came with her own plastic granny glasses and a hair net. Funny now to think about those factors that seemed appealing to have on a doll. I earned my own money to buy my Mrs. Beasley by making loom pot holders! I remember making many of the square loom pot holders in hopes that those in my neighborhood would buy them so that I could have enough money for my Mrs. Beasley doll. They did, so you know I had a fond appreciation for her because of the added efforts in obtaining her. The funny part about finding this doll that day were the comments I got while I was holding her while shopping the rest of that shopping spree. Women would stop to talk about her and tell me that they had a Mrs. Beasley doll too or that they knew someone who had one when they were growing up. One lady even asked if I were planning on buying it for sure because she would consider it if I did not want to purchase it. I did buy it and I guess I was not ready for the reaction of my family when I brought my tiny treasure home. My blast from the past doll. The cats found her curious but were not impressed with it. And my husband did not know why I “needed” a doll at my age. My daughter thought it was “creepy” and said she was going to give her nightmares. Oh well! She is mine. I have been reunited with my friend, Mrs.Beasley! Do you have a flash from the past item that you are attached to for personal or creative reasons? Do share. Creativity is meant to be appreciated. Club Creative Studio wishes you and yours a very Happy New Year. The year 2013 can be a full year of inspiration and appreciation if you welcome it into your life. My daughter and I wish to share a project that you too can do to help you kick off the new year. Are you ready to learn how we are getting our year off to the right start? If you want to resolve to show more gratitude in your life and appreciate the positive and good things that happen to you, this project is for you. This is a project that is meant to creatively hold the written positive thoughts and actions of an entire year. We have cleverly and fondly named our project. We call these creations our “Joy Jars”. Our decorated jars are going to be the hub spot for our daily written sediments of one aspect in the day that was a positive or uplifting aspect of that day. So that we can remember the event, on a small slip of cut paper, we are planning to write down at least one highlight of the day that gave us joy. For an entire year, we hope to continue to fill the jar and stuff in the numerous slips we accumulate. On New Year’s Eve, 2013, we will begin to open up each tab collected and smile at all of the great things that happened to us through out the year in gratitude. Are you inspired to create your own Joy Jar in 2013? We went on a hunt to a few of our local thrift stores in hopes to find low-cost and interesting glass jars with lids. We felt pretty lucky in finding jars that cost $2.00 and $3.00 each. I am sure that you may be able to find something even less in price, recycled, or even around your home that would also suffice for the same purpose. We decorated our jars in different ways. My daughter used many inspirational word stickers, and decorative tapes on her glass jar. She placed them on and around her entire jar so that no matter which way the jar was displayed, it would show a decorative side. She created a simple look but, it is still cute and colorful. Glass jar decorated with stickers and decorative tapes. The jar that I embellished included hand-made polymer clay beads, hand-twisted wire, and pink and red seed beads. I glued the large clay beads on the flat areas of my jar. The jar already had scroll raised designs so adding twisted wire also added the feeling of movement and whimsy to the over-all look. I added seed beads to wire on my decorative jar. I used my hand-made clay beads and wire to embellish my jar. This is the lid of my jar topped with a hand-made clay bead. It is an easy open lid with the added embellishment. To get an idea of some of the simple joys that you too may want to add to your “Joy Jar” read a few of the comments shared from the Club Creative Studio Business Fan Page on Facebook. I asked the fill-in-the-blank question: ____________ brings me joy. These are wonderful examples of sediments that can be added proudly to a “Joy Jar”. Are you inspired to make your own jar? Being specific in your highlighted statement will be the best prompt of recalling the gratitude you felt when reviewing it a year from now. 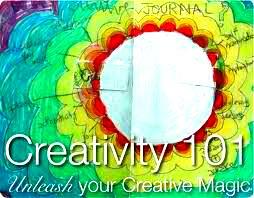 Enjoy creating your “Joy Jar” with your own mark of creativity. 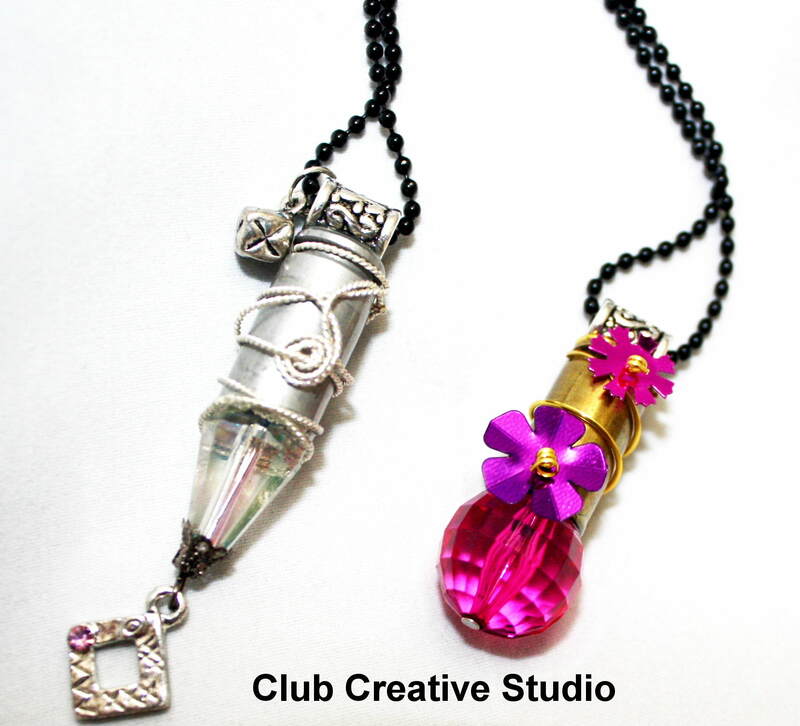 Club Creative Studio’s blog has a focus on creativity. Today’s post features a simple transformation of art. I have often found the need to change something based on how I want it to function and serve a purpose for me. With specific needs in mind, almost anything can be transformed and upcycled with creatively to fit a specific desire. I recently went on a gallery and store hop with a friend Lauren, in an area that is full of interesting places. To mark our memories, I purchased a small piece of art at an import store. This carved wood piece is from Bali. Right away, I loved it and I knew how I wanted to display and use this item in my home as a creative form of inventive storage. I wanted a new place to display and hang some of my personal necklaces, for an easy way to locate and admire them. This carving inspired me to use the bottom portion for this purpose. The tricky part was to figure out how and where I wanted to place the attached screw-hooks. As with anything you are about to drill into, you want to make sure that you are making the right decision and make your marks correctly the FIRST time. These are the hooks I used for my project. In order to not deface the art by placing the hooks directly to the front of the art, Lauren had the suggestion to place the hooks from under the bottom lip of this art. That made perfect sense and left me with the option to remove the hooks at anytime, if I wanted to display this in a different manner at any other given time. The holes could be easily filled later and for the meantime, were at the bottom of the art so it isn’t obvious when and if I removed the hooks. Added hooks on the bottom lip of this art. Finished art transformed in to a display jewelry hanger. The hooks serve as the resting place for my hanging necklaces. I love the functionality of this and the art as well. It is placed in a room that I see it often, and I appreciate the added functionality of this art. This art has now been adapted to my needs. I made it personal to me and useful to me. Have you had the opportunity to alter art? Tell us about your experience and success of your project! If you are looking to do a similar project, I suggest you make sure you have a stable structure to add your hooks to, making sure that your screws do not penetrate through the wood entirely. Space your hooks evenly, secure with adequate twist, and hang over-all project in a manner similar to hanging framed art, with care and concern for strength of nail choice. good Luck with your creativity! You have got to start someplace- start your creativity at the beginning! With an open mind, I write about an “ABC Party” today. They never had these celebrations in my college days (at least I never knew about them). An A. B. C. party is a gathering of people wearing Anything But Clothing! It’s a theme party where the guest’s attire is a specific expression and brought into focus. The point of an ABC party is to have all of your guests show up dressed in everyday items such as newspaper, plastic bags, duck tape, feathers, etc., rather than real clothing. As another “Two-Cent Tuesday” post, I offer suggestions on what to make an outfit from as well as save you money while you are being creative. Plastic bubble wrap- wrap around or form into pattern shape of article of clothing attaching “seams” with clear packing tape. I have even seen pink wrap, wouldn’t that be cool? Sheets- you have heard of a “toga” right? Christmas Lights can be attached to colored plastic wrap. I have seen green cellophane- you could look like a Christmas tree. Body paint- I do not recommend spray paint- let’s be smart here! What do you have round the house to convert into clothing for an ABC party? Have you ever felt the great feeling of being lucky and blessed at the same time? A new friend made me feel wonderful as she hooked me up with a great supply source. Club Creative Studio’s blog shares inspirations of creativity. Today’s post shares the story of how the artful journey of my bullet creations came into being. Using wire-wrapping techniques, beads and clay, I recycled bullets into jewelry art and a few related accessories. When you have the opportunity to creatively transform an unusual item into art, I say…”Go for it”. Remember how thrilled I was when I wrote about the empty bullet shells that I received from visiting my friend? 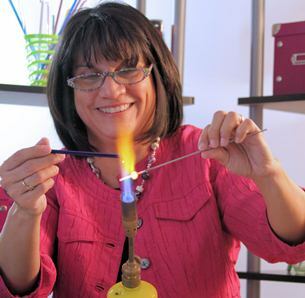 Janet brought to me many more spent bullets and encouraged me to keep creating from them. She recently introduced me to the supply source and he told me a few interesting things that I will also share with you here on the blog. 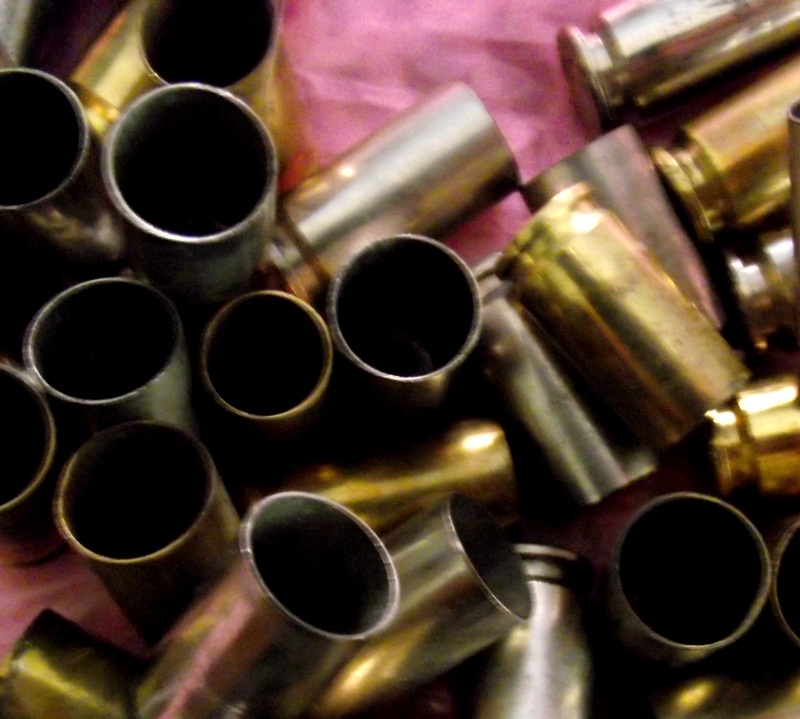 Using empty bullet shells, I created fun recycled art. 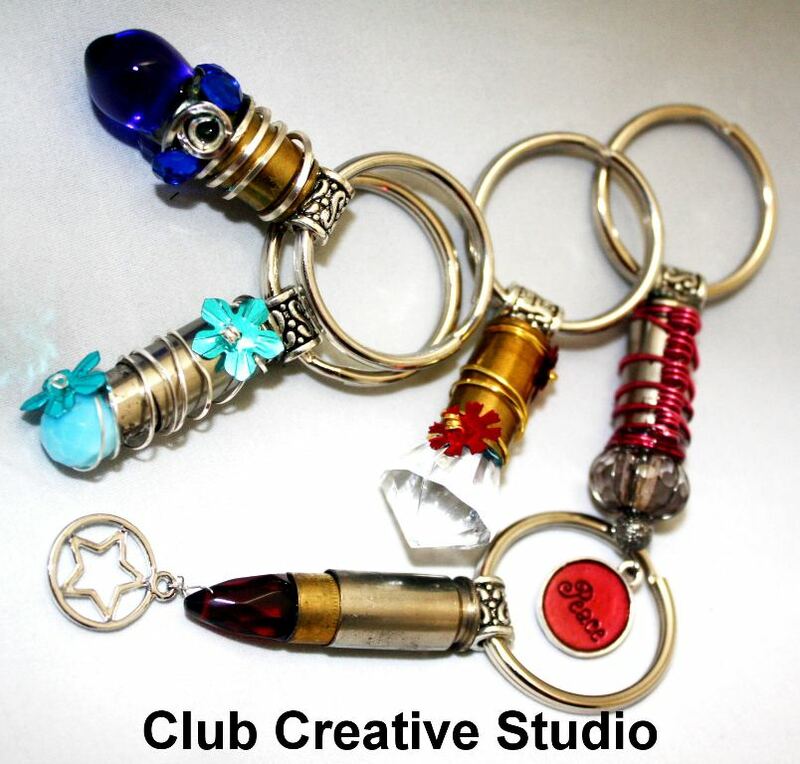 Club Creative Studio Bullet Shell Jewelry Art. Mr. Dan Buckley is a retired police officer. In 1990, Mr. Buckley retired from the Montgomery County Police Department after thirty-three years of dedicated service. He told me about when the force was making a transition from 38 calabar revolvers to the now used 9 millimeter weapons. “The “bad guys” had more powerful weapons than they did.” So, the transition began. While they needed to train with the new guns, they had to shoot many rounds to get comfortable with the use and power. They trained weekly and shot many rounds. Mr. Buckley estimates that the hundred men probably fired around 500 rounds each when they were first making the change-over. Times that by 100 officers and that equals 50,000 empty cases! Dan collected the shells from the ground initially because he planned on reloading them. He did not get around to it. For nearly 25 years, they remained in a 5 gallon bucket in a corner of his garage. I could not wait to make my artful transformations and I continue to dream up new items that I can incorporate the empty shells into. 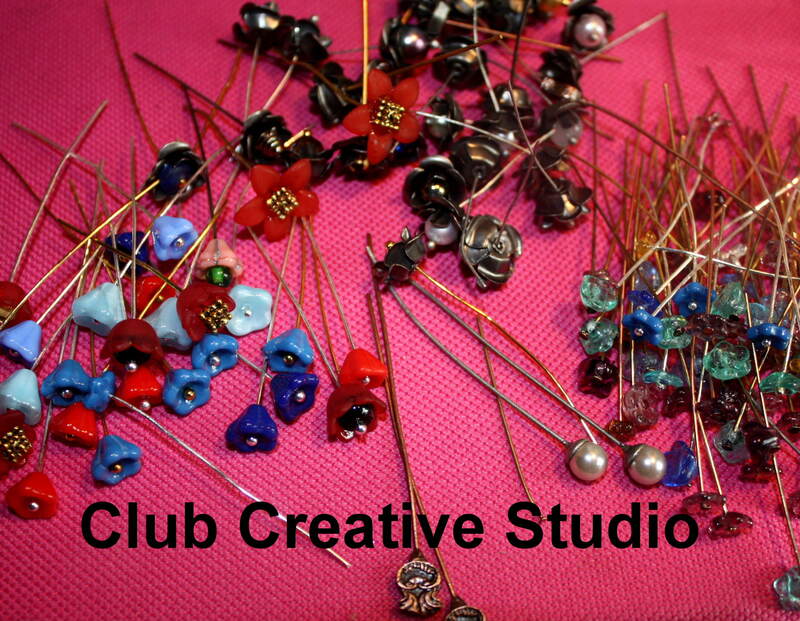 Mini bead flowers on wires are ready to be cut for the Club Creative Studio Bullet Shell Vase Pendants. 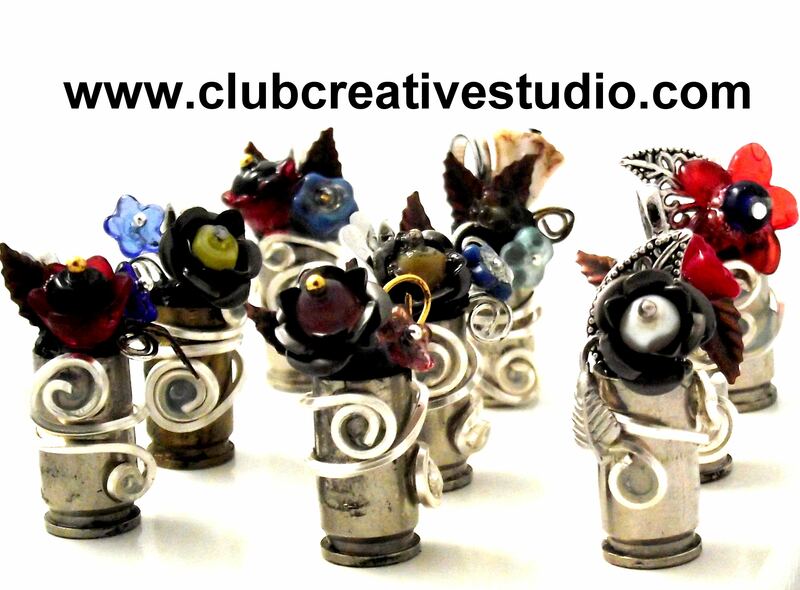 Club Creative Studio bullet Vase Art. When Janet told Mr. Buckley about me and the art that I created from her police officer son’s empty gun shells, he offered to give me the bucket so that I could do more creative art! so, whenever I create another item using the shells, I thank the kind heart of Dan for being my generous supply source. It was great timing and great luck to feel blessed with bullets! I am allowing my mind to wander and expand on other ideas and ways that I can utilize these shells creatively? I have a few creations in the works. If you have any suggestions as to a different way I can use these bullet shells as a new pendant or in a new item, please share your vision. I have a lot of shells to use up! Thank you for sharing your ideas with me. Welcome to the Feature Friday post from Club Creative Studio. 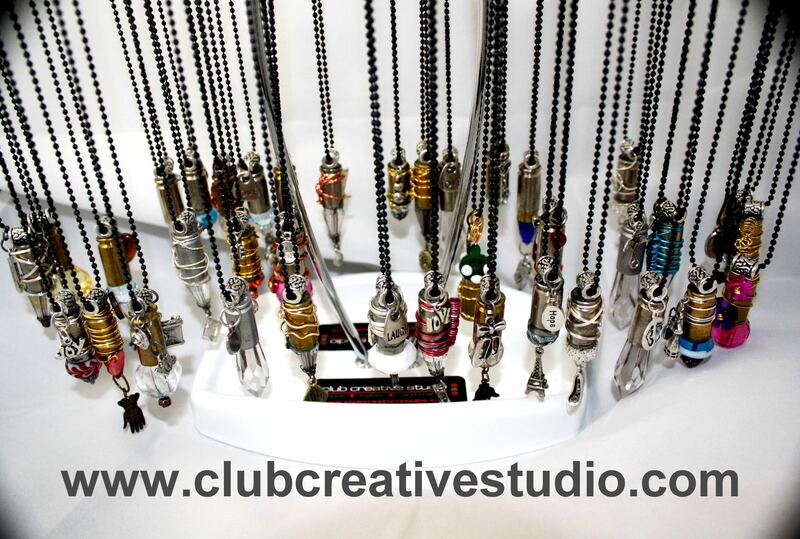 Club Creative Studio Jewelry Art. This post highlights an interesting recent creation. It may have started out as “trash” but, I am happy that I can refer to it as “treasure” now. I spent time visiting an interesting person and in the mist of one of our conversations she quickly swept away the empty gun shells from a desk top to throw away. Her son, a police officer had the discarded shells from his training. Who knew that being tidy in front of me would make her change gears and not toss the trash. I asked her if I could have the empty shells because I had an idea to drill a hole through it and somehow make an interesting pendant. She agreed to share them with a smile and a bit of confusion. It was hard for her to imagine that I could really use them for something artful. I had ideas in my mind, and I could not wait to show her the results. Needless to say, I found a way to be creative with the empty shells. 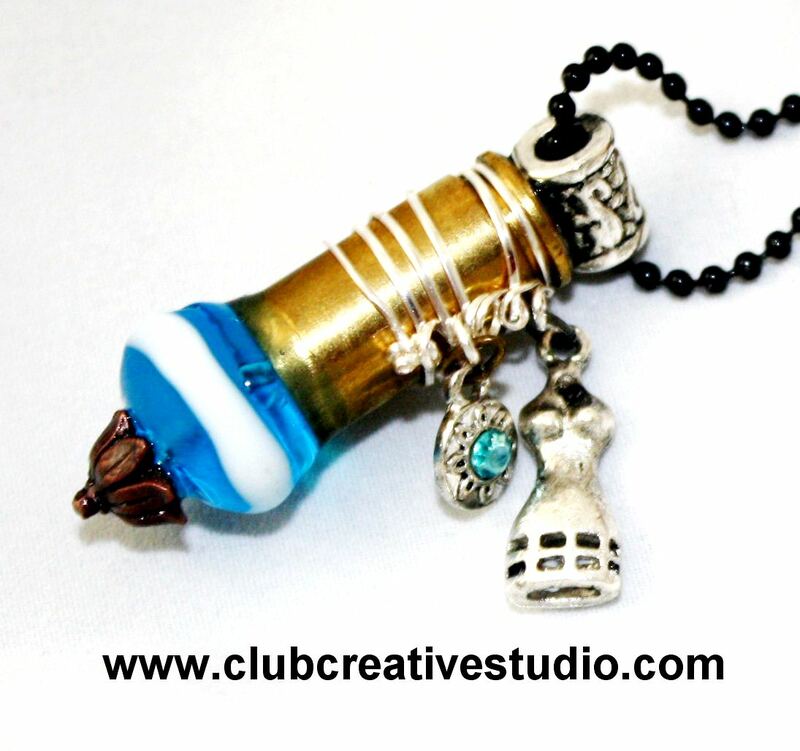 Mixed with a combination of beads, metal wire, crystals, sequins and charms, these bullet shell casings are made to be one-of-a-kind, unique pendants hanging from a simple chain. 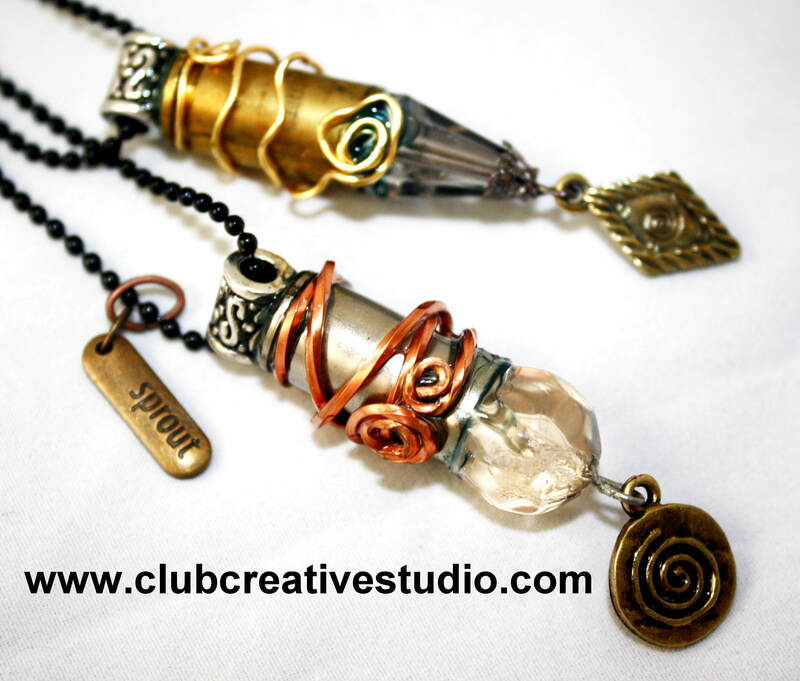 Club Creative Studio bullet pendants are one-of-a-kind creations. These creations will be available online after a brief introduction at a four-day holiday craft fair the first week of November, 2012 in Rockledge, PA. This will probably be the shortest post ever from Club Creative Studio. In today’s TNT (This-N-That) post, I want to share a creative recipe for “puffy paint”. The ingredients are from the kitchen. Before you gather your mixing supplies, take some time to also recycle and collect the containers you wish to place your “paint” in. Take time to clean out your recycled containers for this project. 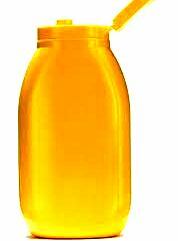 Any recycled plastic bottle that is also a squeeze-type container will work the best. Those plastics from items like emptied shampoo, dish soap, syrup, ketchup. mustard, honey, salad dressings and oil containers, will work fine, for example. Take note of the variety of lid tips because this mixture will be thick yet you want it to flow easily out of the tip of the container you place the paint in. Try it for a fun, different and inexpensive project. It may be exactly what you are looking for in price, texture and technique. 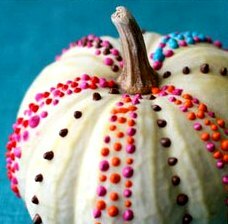 Here is an example of how you can focus this technique on a fall decorative creation. Try a simple, yet striking design like Elsie Larson’s idea from the site Beautiful Mess blog or a more complex design. Mix well, you really don’t want large lumps to form and you want it to flow out of your container tip. Have fun creating with this low-cost activity.